Just ME: Going to the beach blog hop and free digi! Going to the beach blog hop and free digi! If you follow me on instagram, or even on the blog, you know that I've developed a little love for doodling. On the side, I've started to learn adobe illustrator so that I could have nice, stamp-like perfect images of my drawings. 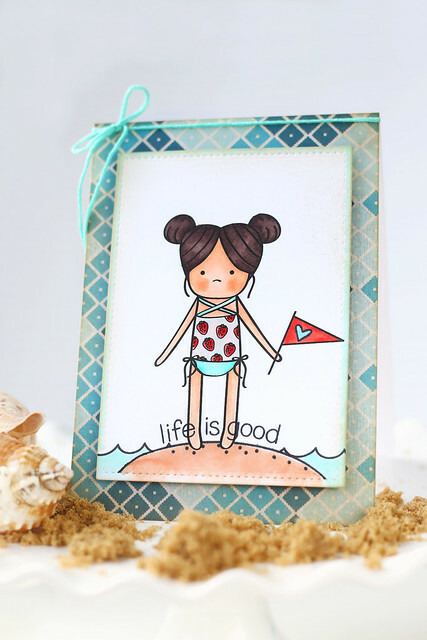 Once I decided on her size and printed her out, I paired her with some beachy lawn fawn stamps, and got to coloring. I love her princess-leia buns and the strawberries on her suit! A little more of a pop-art feel to this one! 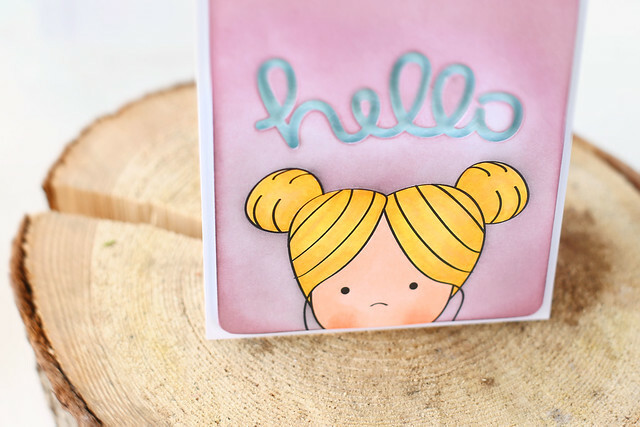 I paired her with the scripty hello die from lawn fawn and sponged purple ink to cover the background. Tip: print her out a 2nd time on thin computer paper, cut her out and paint the back of her head with a 2-way glue pen. When the adhesive dries, you have a mask to use for this kind of treatment. It's hard to tell, but the purple panel is popped up on foam squares - even the little bits inside the scripty die-cut letters. I hope you like her! Since I'm just growing my skills, I'm offering her as a free digi. You can download the JPEG or the PNG versions. Follow the links to whichever format suits you, then right click and save it to your computer. If you decide to download and use her, will you leave me a comment? If even a handful of you like the idea, I'd love to offer a just-for-fun digi here and there. Special thanks to Deasy for formatting the file for me into the download-friendly versions! Thanks for the free digi. She is very cute. Thank you for digi beachgirl...truly appreciate it!! So cute! *mind blown* this little beach bum girl is ADORABLE!!! You have out done yourself! I agree - the Princess Leia buns are SO CUTE!! Eek! And the trendy bathin suit she has is awesome!! I LOVE her paired with lawn fawn! You are so talented! I wish you all the luck in the WORLD! And I hope this free digi turns into a whole new world for you!! (And I'll be cheer leading for you the whole time!) thank you for sharing your image with us! Such cute cute cute cards! She is so cute...really like her Leia buns. Your doodles are very cute. Thanks for this digi. She is so awesome! I have been enjoying seeing your drawings lately! Oh, this is so sweet! You are so talented, Elena! She's totally sweet! Thanks for sharing your skills and freebie with us! Can't wait to play! Sweet cards!!! Love how you made her a bit bigger for the second card! Thanks so much for letting play along with you!! She is adorable. Thank you for sharing with us. Can't wait to make something, using her. Adorable digi; you are so fabulously talented, Elena! Please do share more of your charming images! You are so talented, Elena! 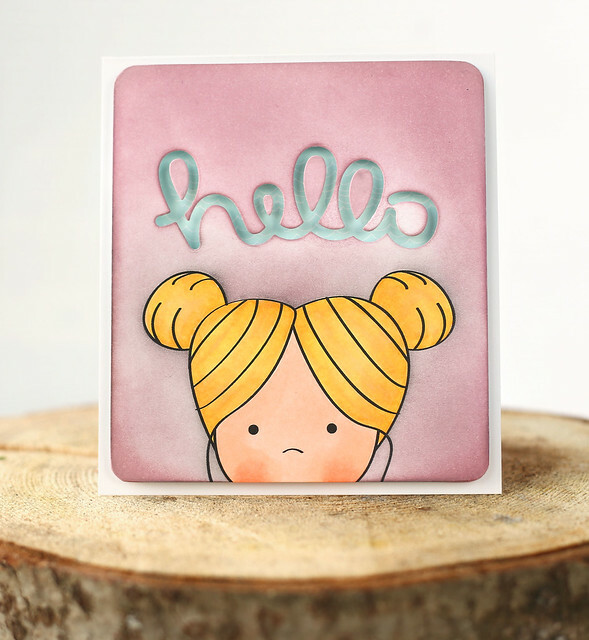 Such an adorable digi and I love how your guest designers used her! So cute! Your coloring puts me to shame, which is why I chose watercolor. Ha! And I love the big head one with the negative hello cut. So cute! Thank you for the free digi. She is darling, I love the strawberry top. Keep at it you are really talented. It's so cute !! Thanks a lot ! How adorable! She is so unique and sweet! You're incredibly talented. Love this adorable little beach girl because she looks just like my 4 year old granddaughter! She wears her hair like this often (curly hair in two side ponytails that look like buns!) Thanks so much for the digi! Such a cute beach girl. I'm not familiar with "digital" stamps. Can't wait to play with her. Thank you for the free digi, the little girl is so sweet. Love the cards you made using her. Thank you Elena for the darling digi, all the cards were great!!! Thank you for the sweet inspiration...I used your darling digi! while I was just meandering around blog-land, I saw a link to your digis so came over to have a look - then found this freebie you have so generously offered to give away for free. She's so cute - reminds me of my sister when we were younger in our bathing costumes! Thank you so much. I love how you showed a different way to use her too. Thank you so much for the freebie! She's the sweetest! She's adorable!!! I downloaded her and plan to use her this weekend! I downloaded your sweet little digi girl... I'll leave a link when I use her... which probably won't be till the kids are back in school! Thanks for your generosity! Your designs are beautiful and I look forward to using them. Thank you so much for sharing your talents so generously. AWE how sweet she looks!!! Love her Princess Lea looking hair buns!!! A little dazzle/lawn fawn week!